We’d love your help. 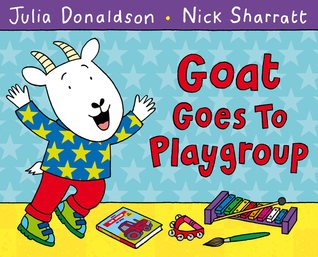 Let us know what’s wrong with this preview of Goat Goes to Playgroup by Julia Donaldson. Playgroup has begun. Time to have some fun. There's a commotion in the classroom as Goat and the other animals spend the day at playgroup. The musical instruments and the dressing up box are lots of fun, but—oh dear!—Goat gets into a muddle or two. A comforting story for any child starting at, or already attending, a playgroup. 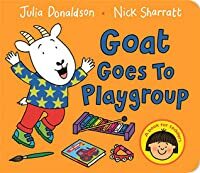 To ask other readers questions about Goat Goes to Playgroup, please sign up. We go to playgroup, so this was a very relevant read, and we could relate to a lot of what happens! Julia Donaldson's rhyming text is as endearing as ever. My two year old loves this one at the moment. Wants it reading over and over at bedtime. This book really turned me off. If you want your child to "fit in", and "do as he's told" regardless of his well being, this book is for you. If you can appreciate the joys and uniqueness each child has on their own, and that trying to fit them into little holes where they can conform to society is detrimental to them, I'd think you'd want to stay away from this book. Being told "don't be silly", made to feel embarrassed to have wet himself, and page after page of material that really irked me. Great story for kids having trouble with mommy leaving while they are at daycare. Looks like there are lots of opportunity yes to us the pictures to talk about kids who are different too. My son just picked it AGAIN from the library. The story is okay but the pictures are the best bit. My son relates it to his nursery school with hanging up the coats etc. the page where Goat wee's himself isn't really needed though! My 3 year old loves the last page where all the parents pick up the kids. She will linger there for 5 minutes sometimes. A great story that the kids love about starting school and all the fun things that they will do. I grew up in a tall Victorian London house with my parents, grandmother, aunt, uncle, younger sister Mary and cat Geoffrey (who was really a prince in disguise. Mary and I would argue about which of us would marry him). I also continued to write “grown-up” songs and perform them in folk clubs and on the radio, and have recently released two CDs of these songs. Funnily enough, I find it harder to write not in verse, though I feel I am now getting the hang of it! My novel THE GIANTS AND THE JONESES is going to be made into a film by the same team who made the Harry Potter movies, and I have written three books of stories about the anarchic PRINCESS MIRROR-BELLE who appears from the mirror and disrupts the life of an otherwise ordinary eight-year-old. I have just finished writing a novel for teenagers.